At the AKI Studio, 585 Dundas St. E., Toronto, Ont. A fascinating play about Tsianina Redfeather, a Creek/Cherokee who was an opera singer in the early 1900s. The production is a busy swirl of movement but the deep implications of the story rise above the distractions. The Story. This is a fascinating play that Jani Lauzon has written. A character named William Morin is a music student who is going off to University on an Indigenous scholarship. While he is a classically trained pianist his aim is to discover the music of his Indigenous roots. As he researches and investigates he learns about Tsianina Redfeather, a Creek/Cherokee opera singer who lived and sung in the early part of the 20th century. The spirit of Tsianina Redfeather seems to oversee William Morin as he struggles to fit in, to find his voice as an Indigenous artist and to discover true Indigenous music that has been appropriated by white musicians and return it to its pure form. And then Redfeather appears to him and they have an on-going dialogue. William Morin learns that Tsianina Redfeather also wanted to bring native songs to a white audience and to do it she travelled with Charles Wakefield Cadman, a white American musician who lectured on the American Indian in his travels. He arranged the music and in a way appropriated it but not in a mean way. Perhaps he was just blinkered. But Tsianina Redfeather went along with it to bring that music and the stories of her people to a larger audience. Cadman wrote an opera semi-based on Redfeather’s life and it was performed at the Metropolitan Opera in 1918 but Tsianina Redfeather did not insist on singing the title role there. She did sing it on tour and in Los Angeles. But when William (Aaron Wells) ‘meets’ Tsianina Redfeather (Marion Newman) and digs deeper into her life and the life of other Indigenous artists, the play deals with deeper issues of appropriation, the total dismissing of the Indigenous voice in their music, stories and history. It’s interesting to see how both William Morin and Tsianina Redfeather deal with the difficulties they meet in their efforts to be heard and to tell their stories. It’s different: Redfeather is patient, thoughtful and has wisdom in solving the problems; William is impatient, frustrated but firm and eventually he finds his way through. Marion Newman plays Tsianina Redfeather with quiet wisdom that is compelling. And she sings the music beautifully, conveying their message with clarity. She wears a traditional Indigenous costume with her headband and moccasins made by Jani Lauzon. There is care in every detail. Aaron Wells plays William Morin with a growing frustration of wanting to take advantage of the opportunity he has been given until he realizes he will have to find another way to discover his people’s music. Then he becomes driven but focused. And he too sings in a strong tenor voice. Richard Greenblatt provides expert piano accompaniment as well as playing Charles Wakefield Cadman, a fussy, fastidious man who thought he was doing good by lecturing on the American Indian. Cadman wrote the opera Shanewis (The Robin Woman) which is partially based on Tsianina Redfeather’s life. There certainly is a lot to consider with this challenging piece. Comment. Initially I get the sense I Call myself Princess is more a collection of facts, information and history rather than a cohesive play. At times there are speeches by William Morin that seem simplistic whining about the plight of the Indigenous people. He has a fight with his partner who is a light-skinned black man on who has suffered more. I’m not sure that kind of dialogue is useful in trying to get a point across. It seems clichéd. 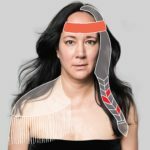 But as the play goes on, playwright Jani Lauzon brings up all sorts of thorny issues of appropriation and deals with them in a thoughtful, measured way. That issue of appropriation and not allowing an Indigenous voice to speak for itself has certainly filled our media of late. I think of Robert Lepage not casting any Indigenous actors to be in his production of KANATA which is about the history of the Indigenous people in Canada. This is an attitude that is so blinkered it’s stunning. That kind of cavalier attitude certainly informs Jani Lauzon’s play but it’s not handled as a rant by the character of Tsianina Redfeather. Lauzon has written her as such a wise woman. She has grace and a watchfulness that allows her to pick her battles. Redfeather speaks up when she disagrees with Cadman regarding the ending of Shenewis and he goes along with her argument and adjusts the ending. Bravo to Jani Lauzon for introducing us to Tsianina Redfeather, her voice, her story and her accomplishments. Produced by Paper Canoe Projects and Cahoots Theatre Productions in association with Native Earth Performing Arts.